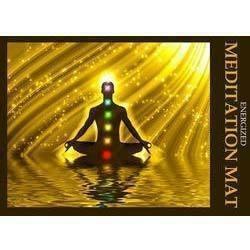 Prominent & Leading Manufacturer from Chennai, we offer energized meditation mat. This Energized Meditation Mat not only cleanses the earth energy by Neutralizing Geopathic Stress if any on the place you sit, but also takes you to the Meditative mode instantly. Both sides of the MAT can be used. The Energy of the Mat is retained for its life time. Price: Rs.450/- per Mat inclusive of Courier Charges within INDIA. Looking for Energized Meditation Mat ?